The following is a collection of article links and notes from around the Web of folks who integrated the Wisconsin Solidarity Map image into their perspective of the latest events happening in our state of Wisconsin. 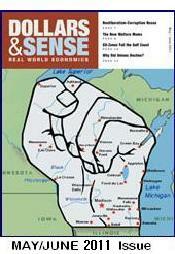 Cover for May/June, 2011 issue of Dollars and Sense Magazine. The ability of average citizens to create and distribute such material, without having to ask permission from anyone, can have a catalyzing effect on the democratic impulse. People who have felt disenfranchised from the power structures of a country can find a way to route around those roadblocks and have a huge effect. 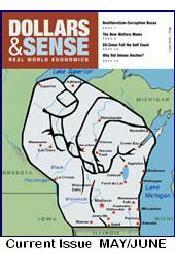 SEIU Image used for solidarity rally for Wisconsin workers. A high-five goes out to Dan Hartung and family from here in Janesville, Wisconsin for their Solidarity poster. Mother Jones Article "What's happening In Wisconsin Explained"
At The DuPont Circle Rally In D.C.
A special thank you to Edward Kimmel of Takoma Park, Maryland for the beautiful work on his large Solidarity poster. My dad was an organizer for AFSCME and president of the local chapter over the course of nearly 30 years in Ohio - another area rising up. I want to be in Wisconsin so bad right now. This gives me hope that the working class is not dead and is becoming conscious of its existence as a class. If I missed anyone it was unintentional. Let me know if you'd like to be added to this page as it will be a continuing work in progress. "we don't put crosshairs on ours"
Filed under "democracy and freedom."